My poem "799-7632" was published on Silver Birch Press's blog.That's me in my 8th grade graduation dress. You can view the post and read the rest here. 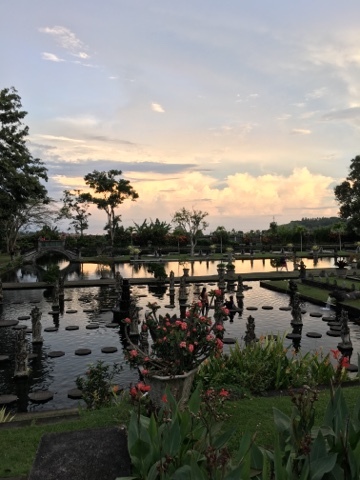 This summer I was fortunate to go on a two week writing retreat/tour in Bali under the guidance by writing/writing coach Laura Davis, Judy Slattum and Made Surya of Danu Tours, with healer and movement teacher Evelyn Hall. While in Bali I saw women lighting incense in their daily offerings, showing their deep connection to the spirit. I saw many smiling faces, people who seemed truly happy with life if even for only that moment. While in Bali I saw banana leaves swaying in the wind, bright hanging flowers. I saw hens herding their chicks across roads. I saw motorbikes loaded with families and people carrying great bundles of goods. While I was in Bali I saw dancers of strange beauty and grace dance their steps with tight precision. While in Bali I heard the roosters crow every morning whether in town or country. I heard greetings: “Selamat pagi” and “hallo” from everyone I met. I heard “Terima kasih” and “same sama" for each small kindness. 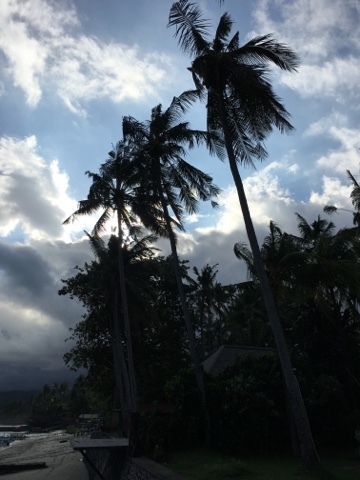 While in Bali I heard the rustle of palm leaves and the sharp pounding of rain on the roof. I heard the cooing of brown doves and the sharp cries of birds I had never met before. I heard the chak, chak of the kecak monkey chorus and tickling gamelan music. I heard priests chant at dawn each morning. While in Bali I smelled the sweet scent of flowers at night: plumeria blooms, jasmine and bougainvillea. I smelled the pungent odor of decaying offerings and onions frying in the kitchen at noon. I smelled the mildew of fabric that won’t dry in the humid air. While in Bali I smelled chili and lemongrass and ginger in broth. I smelled coffee brewing and chocolate being made. While hiking through the Balinese countryside. I smelled manure and cows and pigs. I smelled wet moss on cold stone steps. While in Bali I tasted the stickiness of palm sugar, the taste of fresh unsweetened coconut. I tasted peanut sauce and ginger and garlic, the ever present nutty tempe. While snorkeling in Bali I tasted the salt of ocean water on lips. I tasted shrimp crackers and nasi goreng and nasi campur and mei goreng. I tasted cacao seeds and clove flowers picked from trees. 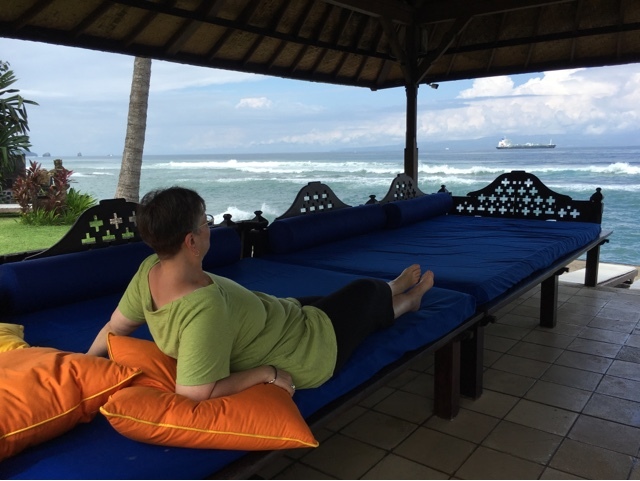 While in Bali I felt the trickle of sweat down my back and cool mountain breezes. I felt a deep wonder at the richness of this small island. While in Bali I felt a deep stillness in my heart. I felt rain pour over me and waded through puddles up to my ankles. While in Bali I felt the earth under my bare feet. I felt the rhythm of dance. While I in Bali I met Balinese writers and dancers and artists of all kinds. I met children who played music for us, and women who took care of us. I met drivers who steered us to where we needed to go. I met the stars in the dark sky at night. I met geckos and large brown butterflies and wasps the size of birds. I met huge snails that ate hibiscus flowers from my outdoor bathroom. While in Bali I was reminded that how I live is not the only way. I was reminded to dance and sing, to live in my whole body instead of just in my head. I was reminded of the importance of meeting new people and opening myself to those around me. I was reminded to go out into nature and shake off the dust of cities. I was reminded of how good it feels to go barefoot and to stop worrying about dirty feet. 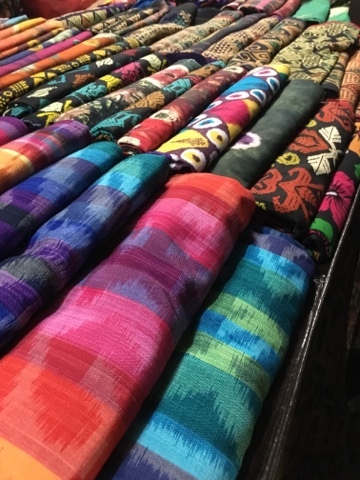 While I was in Bali I was reminded of how important traditions and art can be, how it feels to live in a community that cares for one another. 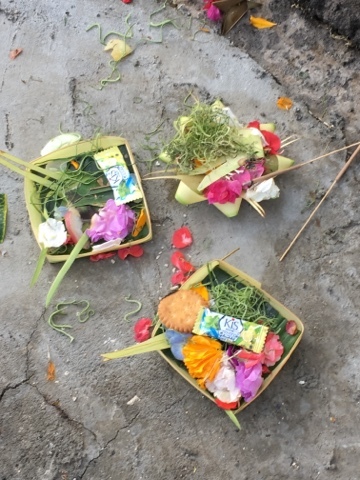 While in Bali, I learned how importance of the cycle of life and death. I learned what it means for people to live surrounded by symbols of their spirit. 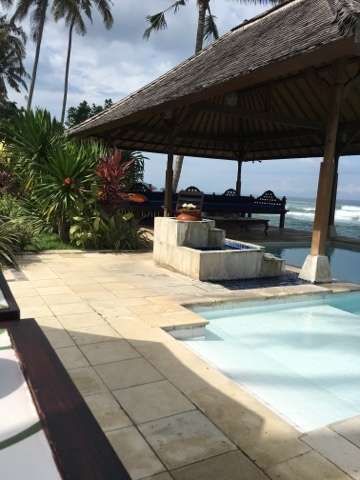 While in Bali I learned I might be persuaded to believe in reincarnation if I could stay here long enough. 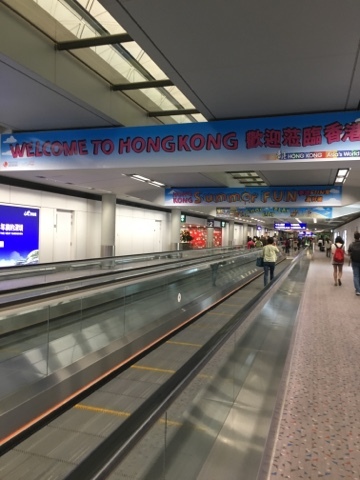 I learned to love this place of great beauty as well as great trouble, of hordes of tourists and quiet rice fields, of brightly colored flowers and great piles of trash. I learned to go down a river on a raft, tie a sarong and listen to prayers without understanding a word. I learned to trust the politeness of those around me. While I in Bali I learned to sit still and let my senses open wide. After a year of planning, I'm finally on my way to Bali to write with Laura Davis and a crew of unknown writing buddies. First leg of the trip is done. I love Cathay Pacific - I actually had enough leg room to sleep for a few hours. I have a 4 hour layover but there is a Starbucks across from where I'm waiting. At times like these I find it difficult to criticize global capitalism. Today after I drove my friend, Ruth to the airport, "Claire de Lune" came on the radio. I've always found this piece by Debussy to be sweetly melancholy, and today it was the perfect music for my mood. Now I sit in my house alone with just my own thoughts and notebook for company. I've looked forward to this solitude. The promise of this time got me through the last hectic weeks of work before summer vacation, of tying up the loose ends of the school year. But now that I have what I wanted, I wish my friend had not left. Just a week ago at this time I was in Sea Ranch on the Northern California coast in a funky rental house on the edge of the Pacific Ocean. Two of my writer friends shared this house with me. Down the road, two other houses, both filled with other friends. Nine women who had come together for our annual writer retreat. That whole week the presence of my friends surrounded my writing with love. I remember the first time I went to camp when I was 10. I was nervous and apprehensive the whole long drive up to the campgrounds. I didn't know anyone and wasn't sure what to expect. Then it turned out to be such a glorious experience. When my parents came to pick me up after the week was over, I cried all the way home in the car. Every time I leave Sea Ranch, I think of that long-ago car ride. Today I don't feel quite as bereft as that 10-year-old girl. Just a little sad. I guess it's to be expected, coming down from the exuberance of this year's experience of what my sister calls Poetry Camp. As all of us have flown off to our private corners, I am grateful for the flurry of texting, photos and emails we've sent each other. We find it hard to let go sometimes. I know we will stay in touch over the year, but it's not the same as sitting around the table laughing and eating, writing together, or listening to each other read new work. Nothing can replace that shared community. I'll have to wait until next June for that. For the past few years, I've made an annual trek to the northern California coast to Sea Ranch. This is a rather other-worldly place. Made up of a community of cedar-sided houses perched on the edge of the Pacific, there is little to do here. In June, it's windy and chilly. The nearest town is tiny Gualala, 12 miles up the road. So what's the draw? For me, it's the chance to be with an amazing group of women I met in 2011 at the AROHO retreat at Ghost Ranch in New Mexico. Another ranch, another place where there was nothing to do except eat, read, write, talk and experience the beauty of nature. This year at Sea Ranch my bedroom is in the library of one of the houses we've rented. As I type this, I sit surrounded by books. Out my window, the ocean roars, gulls riding the wind currents. This is a glorious, wild place to begin my summer vacation. Every year when I come to Sea Ranch, I set myself writing goals, just as I would expect of my own students. This blog post is the beginning of my first goal for 2016: begin a book campaign. One of the wonderful women in my mighty band of writers here is Ruth Thompson who runs Saddle Road Press out of Hilo, Hawaii. I am honored that Saddle Road will be publishing my first full-length book of poetry in December. Creating a book of poetry can be a long, painstaking process. I published my chapbook, In the Poem an Ocean (Big Table Publishing) in December of 2010. For the last six years, I've been slowly and steadily building a new collection of poems. And now my completed manuscript is in the hands of my trusty publisher. Well, at least the first draft is in her hands! I know I have many revisions to go through before the book is ready to go out into the world. All writers can expect that. We may not like it, but we expect it. It's what writers do. What many people don't know is the other work that goes into getting a book into people's hands, especially a book of poetry from a small press. And that's a marketing campaign. Most of my non-writer friends are surprised when I tell them that I will be responsible for marketing my book. But it's true. Being a poet and teacher, I never thought I'd have to add PR representative to my resumé. Now I am. So in the next six months, I'm off on a new adventure of revision, choosing a cover -- and marketing. I know I'm not alone in this. I'm lucky to have writer friends who have given me great advice already. But I'm always looking for more ideas. I'd love to hear from others, not just writers, who have have been on the same path. I know artists, photographs or filmmakers face the same challenges. What was it like for you to get your work known? Maybe I'll add your ideas to my to-do list. Hello Slice of Life community! Happy National Poetry Month! This is my third year of participating in NaPoWriMo, National Poetry Writing Month. The goal is to write a poem every day for the entire month. This year, coming right off the Slice of Life Story Challenge in March, I wasn't sure I'd make it all through April this year so I decided not to post every poem as I did last year. It turns out my instincts were correct. So far, I've done fairly well but have missed a couple of days. Since sharing is part of the fun, I joined a private Facebook group with a several of my friends. We're posting our almost-daily poems and commenting on them. Because it's private, the pressure is off. They will still like me if I don't show up every day. I thought this could be a great prompt to use with students. If you try it in your classroom, I'd love to see the results. Happy writing. SOL 2016 Day 29: Spring Break! Today I consider my first real day of Spring Break. I've been off for four days now, but visiting family always takes a bit of work, driving back and forth to visit Mom and Dad, Brother, Sister-in-Law and Niece takes energy. Wonderful to see them, but still some work. This day I slept in, wrote my morning pages, then unpacked my suitcase and went out to buy groceries. Enough chores so that I didn't feel completely slothful. But for the rest of the day, I did very little. I read a few pages of my new book and fell asleep in my chair. I watched some inane television shows, and fell asleep in my chair. Yep, today feels like Spring Break. SOL 2016 Day 28: Really Only Four Days Left? Here I am, having posted for 27 days in a row. Some posts were more successful than on others, depending on the demands of daily life and my involvement level. That's how writing goes no matter what the task. For a few days now I've been counting down, hoping I could make it to the end of the month. Now that there are only four more posts, including this one, I find myself feeling almost nostalgic. I've participated in such online challenges before. For the entire year of 2014, as part of a private Facebook group, I wrote and posted a haiku everyday (well, to be honest, almost every day. I missed 2 or 3). Writing haiku became so much a part of my life that I've continued with that group although I admit I haven't written one every day. But every few days I find a haiku within me to post. Last year I wrote a poem each day for NaPoWriMo as part of National Poetry Month. National Poetry Month - April - starting four days from now. And that's what I've been pondering as I reach the end of the Slice of Life Story Challenge. Am I up for another month of writing and posting? Can I come up with 30 poems? I find myself doubting my ability to commit in the same way I felt as March 1st rolled around for Slice of Life. But as I make it to the home stretch of this wonderful journey, I feel that maybe, just maybe I can keep going. Yesterday I got the email I've been waiting for. Along with two of my co-workers, I've been accepted for a second year of Writing Workshop training at Columbia University's Teachers College in New York. Last August, studying at Teachers College was one of the most inspirational experience of my educational career. I loved participating in mini-lessons, listening to advice from expert writing teachers and writing, writing, writing. I was in heaven. Then being able to work with my coachee teachers in bringing writing workshop to life in their classrooms has been incredibly rewarding. It's wonderful to see students engaged in writing that is personal and authentic. This has been an incredible journey, and I'm glad it's not over. See that smile on my face? I expect to look like that again this summer. Today I put in a 12 hour work day. With the rest of our district's ELA Department team, I made a school board presentation this evening. As I walked outside and saw the beautiful full moon, I thought, "what a great thing to write about." That's when I realized I hadn't posted for today. It had completely slipped my mind. School Board presentation tonight. Nuff said.